Among the entries from the pros was this one, from Seattle’s own ever-creative chef Mark Fuller of Spring Hill: crumbling Tim’s Cascade Style Potato Chips — mixed with panko — as coating for pan-fried crab cakes. Sounds like an effort sure to work just as well with pan-fried chicken breast, or a pounded pork loin-chop, dishes that see regular rotation in my house. Which reminds me . . .
For an easier method, try a Ziploc bag and a rolling pin. 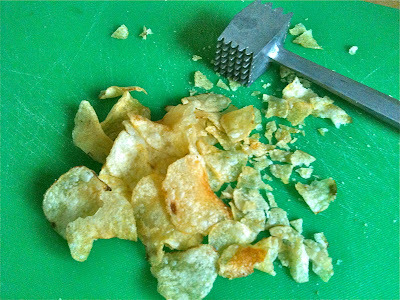 Way back when — when I waited tables at the Mad Batter in Cape May, NJ — the lunch menu included a popular salad topped with the same ingredient: crumbled potato chips, though in Cape May those chips were more likely to come in a blue package bearing the name Wise.